The Los Angeles County Museum of Art was established as a museum in 1961. Prior to this, LACMA was part of the Los Angeles Museum of History, Science and Art, founded in 1910 in Exposition Park near the University of Southern California. Howard F. Ahmanson, Sr., Anna Bing Arnold and Bart Lytton were the first principal patrons of the museum. Ahmanson made the lead donation of $2 million, convincing the museum board that sufficient funds could be raised to establish the new museum. In 1965 the museum moved to a new Wilshire Boulevard complex as an independent, art-focused institution, the largest new museum to be built in the United States after the National Gallery of Art. The museum, built in a style similar to Lincoln Center and the Los Angeles Music Center, consisted of three buildings: the Ahmanson Building, the Bing Center, and the Lytton Gallery (renamed the Frances and Armand Hammer Building in 1968). The board selected LA architect William Pereira over the directors' recommendation of Ludwig Mies van der Rohe for the buildings. According to a 1965 Los Angeles Times story, the total cost of the three buildings was $11.5 million. Construction began in 1963, and was undertaken by the Del E. Webb Corporation. Construction was completed in early 1965. At the time, the Los Angeles Music Center and LACMA were concurrent large civic projects which vied for attention and donors in Los Angeles. When the museum opened, the buildings were surrounded by reflecting pools, but they were filled in and covered over when tar from the adjacent La Brea Tar Pits began seeping in. Money poured into LACMA during the boom years of the 1980s, a reportedly $209 million in private donations during director Earl Powell's tenure. To house its growing collections of modern and contemporary art and to provide more space for exhibitions, the museum hired the architectural firm of Hardy Holzman Pfeiffer Associates to design its $35.3-million, 115,000-square-foot Robert O. Anderson Building for 20th-century art, which opened in 1986 (renamed the Art of the Americas Building in 2007). In the far-reaching expansion, museum-goers henceforth entered through the new partially roofed central court, nearly an acre of space bounded by the museum's four buildings. The museum's Pavilion for Japanese Art, designed by maverick architect Bruce Goff, opened in 1988, as did the B. Gerald Cantor Sculpture Garden of Rodin bronzes. In 1999, the Hancock Park Improvement Project was complete, and the LACMA-adjacent park (designed by landscape architect Laurie Olin) was inaugurated with a free public celebration. The $10-million renovation replaced dead trees and bare earth with picnic facilities, walkways, viewing sites for the La Brea tar pits and a 150-seat red granite amphitheater designed by artist Jackie Ferrara. Also in 1994, LACMA purchased the adjacent former May Company department store building, an impressive example of streamline moderne architecture designed by Albert C. Martin Sr. LACMA West increased the museum's size by 30 percent when the building opened in 1998. In 2004 LACMA's Board of Trustees unanimously approved a plan for LACMA's transformation by architect Rem Koolhaas, who had proposed razing all the current buildings and constructing an entirely new single, tent-topped structure, estimated to cost $200 million to $300 million. Kohlhaas edged out French architect Jean Nouvel, who would have added a major building while renovating the older facilities. The list of candidates had previously narrowed to five in May 2001: Koolhaas, Nouvel, Steven Holl, Daniel Libeskind and Thom Mayne. However, the project soon stalled after the museum failed to secure funding. In 2004 LACMA's Board of Trustees unanimously approved plans to transform the museum, led by architect Renzo Piano. The planned transformation consisted of three phases. Phase I started in 2004 and was completed in February 2008. The renovations required demolishing the parking structure on Ogden Avenue and with it LACMA-commissioned graffiti art by street artists Margaret Kilgallen and Barry McGee. The entry pavilion is a key point in architect Renzo Piano's plan to unify LACMA's sprawling, often confusing layout of buildings. The BP Grand Entrance and the adjacent Broad Contemporary Art Museum (BCAM) comprise the $191 million (originally $150 million) first phase of the three-part expansion and renovation campaign. BCAM is named for Eli and Edy Broad, who gave $60 million to LACMA's campaign; Eli Broad also serves on LACMA's board of directors. BCAM opened on February 16, 2008, adding 58,000 square feet (5,400 m2) of exhibition space to the museum. In 2010 the Lynda and Stewart Resnick Exhibition Pavilion opened to the public, providing the largest purpose-built, naturally lit, open-plan museum space in the world. The second phase was intended to turn the May building into new offices and galleries, designed by SPF Architects. As proposed, it would have had flexible gallery space, education space, administrative offices, a new restaurant, a gift shop and a bookstore, as well as study centers for the museum's departments of costume and textiles, photography and prints and drawings, and a roof sculpture garden with two works by James Turrell. However, construction of this phase was halted in November 2010. Phase two and three were never completed. In October 2011, LACMA entered into an agreement with the Academy of Motion Picture Arts and Sciences under which the Academy will establish its Academy Museum of Motion Pictures, in the May building. The redesign and additions are designed by Renzo Piano as well. Construction of the renovated building is ongoing and the Academy Museum is set to open by 2020. In 2010 LACMA partnered with Los Angeles's Department of Cultural Affairs in an effort to ensure the preservation of the Watts Towers, offering its staff, expertise, and fundraising assistance. Specifics about the third phase, which initially was to involve renovations to older buildings, long remained undisclosed. In November 2009, plans were made public that LACMA's director Michael Govan was working with Swiss architect and Pritzker Prize laureate Peter Zumthor on plans for rebuilding the eastern section of the campus. The Perreira Buildings between the two new Renzo Piano buildings and the tar pits. With an estimated cost of $650 million, his first proposal called for a horizontal building along Wilshire Boulevard. It would be wrapped in glass on all sides and its main galleries would be lifted one floor into the air. The wide roof would be covered with solar panels. In a later concession to concerns raised by its neighbor, the Page Museum, LACMA had Zumthor alter the shape of his proposed building to stretch across Wilshire Boulevard and away from the La Brea Tar Pits. In June 2014, the Los Angeles County Board of Supervisors approved $5 million for LACMA to continue its proposed plans to tear down the structures on the east end of its campus for a single museum building. Later that year, they approved in concept a plan that would provide public financing and $125 million toward the $600-million project. On April 8th, 2019, The Zumthor designed building was approved by the LA county board of Supervisors. The final approved building designed was drastically scaled back from the original 387,500 square feet to 347,500. With gallery space shrinking from 121,000 square feet to 110,000 square feet. Also dropping the black form aesthetics, reducing it to a one level, above ground, glass enclosed sand colored concrete design, to save costs. The design still calls for a arm above Wilshire Boulevard. The total cost of $650 million, with LA county providing $125 million in funds and the rest raised by fundraising. Per reports LACMA has only raised $560 million total since December 2018. The re-designed final building was balked by local architects, including the LA times editorial architect Christopher Knight, calling the design "half baked". The Los Angeles City council is to approved air rights, design and allow demolition and construction to begin at a later date. The Zumthor building opening has been pushed back to 2024. In 1971, curator Maurice Tuchman’s revolutionary “Art and Technology” exhibit opened at LACMA after its debut at the 1970 World Exposition in Osaka, Japan. The museum staged its first exhibition by contemporary black artists later that year, featuring Charles Wilbert White, Timothy Washington and David Hammons, then little known. The museum's best-attended show ever was "Treasures of Tutankhamun," which drew 1.2 million during four months in 1978. The 2005 "Tutankhamun and the Golden Age of the Pharaohs" drew 937,613 during its 137-day run. A show of Vincent van Gogh masterpieces from the artist's eponymous Amsterdam museum is the third most successful show, and a 1984 exhibition of French Impressionist works is fourth. In 1994, “Picasso and the Weeping Women: The Years of Marie-Therese Walter and Dora Maar” opened to rave reviews and large crowds, drawing more than 153,000 visitors. Since the arrival of current director Michael Govan, about 80% of just over 100 featured temporary exhibitions have been of Modern or contemporary art while the permanent exhibitions feature work dating from antiquity, including pre-Columbian, Assyrian and Egyptian art through contemporary art. More recent exhibits, fousing on popular culture and entertainment, have also been well-received, both by critics and patrons. Exhibits devoted to the works of movie-directors Tim Burton and Stanley Kubrick drew especially positive reactions and responses. LACMA's more than 120,000 objects are divided among its numerous departments by region, media, and time period and are spread amongst the various museum buildings. Not to be confused with The Broad, another contemporary art museum funded by the Broads, in Downtown Los Angeles. The Modern Art collection is displayed in the Ahmanson Building, which was renovated in 2008 to have a new entrance featuring a large staircase, conceived as a gathering place similar to Rome's Spanish Steps. Filling the atrium at the base of the staircase is Tony Smith's massive sculpture Smoke (1967). The plaza level galleries also house African art and a gallery highlighting the Robert Gore Rifkind Center for German Expressionist Studies. The modern collection on the plaza level displays works from 1900 to the 1970s, largely populated by the Janice and Henri Lazarof collection. In December 2007, Janice and Henri Lazarof gave LACMA 130 mostly modernist works estimated to be worth more than $100 million. The collection includes 20 works by Picasso, watercolors and paintings by Paul Klee and Wassily Kandinsky and a considerable number of sculptures by Alberto Giacometti, Constantin Brâncuși, Henry Moore, Willem de Kooning, Joan Miró, Louise Nevelson, Archipenko, and Arp. The Contemporary Art collection is displayed in the 60,000-square-foot (5,600 m2) Broad Contemporary Art Museum (BCAM), opened on February 16, 2008. BCAM's inaugural exhibition featured 176 works by 28 artists of postwar Modern art from the late 1950s to the present. All but 30 of the works initially displayed came from the collection of Eli and Edythe Broad (pronounced "brode"). Long-time trustee Robert Halff had already donated 53 works of contemporary art in 1994. Components of that gift included Joan Miró, Jasper Johns, Sam Francis, Frank Stella, Lari Pittman, Chris Burden, Richard Serra, John Chamberlain, Matthew Barney, and Jeff Koons. It also provided LACMA with its first drawings by Claes Oldenburg and Cy Twombly. Back Seat Dodge ’38 (1964), by Edward Kienholz, is a sculpture portraying a couple engaged in sexual activity in the back seat of a truncated 1938 Dodge automobile chassis. The piece won Kienholz instant celebrity in 1966 when the Los Angeles County Board of Supervisors tried to ban the sculpture as pornographic and threatened to withhold financing from LACMA if it included the work in a Kienholz retrospective. A compromise was reached under which the sculpture's car door would remain closed and guarded, to be opened only on the request of a museum patron who was over 18, and only if no children were present in the gallery. The uproar led to more than 200 people lining up to see the work the day the show opened. Ever since, Back Seat Dodge ’38 has drawn crowds. The Art of the Americas Building has American, Latin American, and pre-Columbian collections displayed on the second floor and temporary exhibition space on the first floor. Formerly known as the Anderson Building, the Art of the Americas Building comprises galleries for art from North, Central, and South America. LACMA's Latin American Art galleries reopened in July 2008 after several years renovation. The Latin American collection includes pre-Columbian, Spanish Colonial, Modern, and contemporary works. Many recent additions to the collection were financed by sales of works from an 1,800 piece holding of 20th century Mexican art compiled by dealer-collectors Bernard and Edith Lewin and given to the museum in 1997. The pre-Columbian galleries were redesigned by Jorge Pardo, a Los Angeles artist who works in sculpture, design, and architecture. Pardo's display cases are built from thick, stacked sheets of medium-density fiberboard (MDF), with spacing of equal thickness in between the 70-plus layers. The laser-cut organic forms undulate and swell out from the walls, sharply contrasting to the rectangular display cases found in most art museums. The museum's pre-Columbian collection began in the 1980s with the first installment of a 570-piece gift from Southern California collector Constance McCormick Fearing and the purchase of about 200 pieces from L.A. businessman Proctor Stafford. The holdings recently jumped from about 1,800 to 2,500 objects with a gift of Colombian ceramics from Camilla Chandler Frost, a LACMA trustee and the sister of Otis Chandler, former Los Angeles Times publisher, and Stephen and Claudia Muñoz-Kramer of Atlanta, whose family built the collection. A sizable portion of LACMA's pre-Columbian collection was excavated from burial chambers in Colima, Nayarit and other regions around Jalisco in modern-day Mexico. LACMA boasts one of the largest collections of Latin American art due to the generous donation of more than 2,000 works of art by Bernard Lewin and his wife Edith Lewin in 1996. In 2007 the museum signed an agreement with the Fundación Cisneros for a loan of 25 colonial-style works, later extended until 2017. The Spanish Colonial collection includes work from 17th and 18th century Mexican artists Miguel Cabrera, José de Ibarra, José de Páez, and Nicolás Rodriguez Juárez. The collection has galleries for Diego Rivera and Rufino Tamayo. The Latin American contemporary gallery highlights works Francis Alÿs. 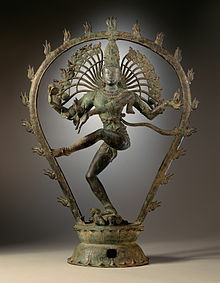 Chola dynasty statue depicting Shiva dancing as Nataraja from LACMA. The Hammer Building houses the Chinese and Korean collections. The Korean art collection began with the donation of a group of Korean ceramics in 1966 by Bak Jeonghui, then president of the Republic of Korea, after a visit to the museum. LACMA today claims to have the most comprehensive holding outside of Korea and Japan. The Pavilion for Japanese Art displays the Shin'enkan collection donated by Joe D. Price. In 1999 LACMA trustee Eric Lidow and his wife, Leza, donated 75 ancient Chinese works valued at a total of $3.5 million, including important bronze objects and prime examples of Buddhist sculpture. 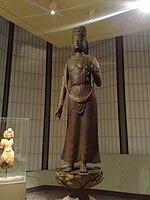 LACMA also has a rich collection of relics from India, mostly consisting of sculptures of Jain Tirthanakaras, Buddha and Hindu deities. Many Paintings from India are also present in the LACMA. Elephant with Riders, Uttar Pradesh, India, 3rd-2nd century B.C. The second floor of the Ahmanson Building has Greek and Roman Art galleries. A large portion of the museum's ancient Greek and Roman art collection was donated by William Randolph Hearst, the publishing magnate, in the late 1940s and early 1950s. The museum's Islamic galleries include over 1700 works from ceramics and inlaid metalwork to enameled glass, carved stone and wood, and arts of the book from manuscript illumination to Islamic calligraphy. The collection is especially strong in Persian and Turkish glazed pottery and tiles, glass, and arts of the book. The collection began in earnest in 1973 when the Nasli M. Heeramaneck Collection was gifted to the museum. In 1990 Max Palevsky gave 32 pieces of Arts and Crafts furniture to LACMA ; three years later, he added an additional 42 pieces to his gift. In 2000, he donated $2 million to LACMA for Arts and Crafts works. He supplied about a third of the 300 objects displayed in a 2004–05 LACMA exhibit, "The Arts and Crafts Movement in Europe and America: 1880–1920" and in 2009, the museum presented "The Arts and Crafts Movement: Masterworks From the Max Palevsky and Jodie Evans Collection." With a single acquisition in 2009, LACMA became a major center for the study and display of 18th- and 19th-century European clothing when it bought the holdings of dealers Martin Kamer of London and Wolfgang Ruf of Beckenried, Switzerland—about 250 outfits and 300 accessories created between 1700 and 1915, including men's three-piece suits, women's dresses, children's garb, and a vast array of shoes, hats, purses, shawls, fans, and undergarments. Los Angeles sculptor Robert Graham created the towering, bronze Retrospective Column (1981, cast in 1986) for the entrance of the Art of the Americas Building. A new contemporary sculpture garden was opened directly east of the museum's Wilshire Boulevard entrance in 1991, including large-scale outdoor sculptures by Alice Aycock, Ellsworth Kelly, Henry Moore, and others. The centerpiece of the garden is Alexander Calder's three-piece mobile Hello Girls, commissioned by a women's museum-support group for the museum's opening in 1965. Situated in a curving reflecting pool, the mobile has brightly colored paddles that are moved by jets of water. The Ahmanson Building's atrium was remodeled to hold Tony Smith's Smoke, which had not been displayed since its original 1967 presentation at Washington, D.C.'s Corcoran Gallery of Art. The massive black painted aluminum artwork is made up of 43 piers and is 45 ft (14 m) long, 33 ft (10 m) wide, and 22 ft (6.7 m) high. The newly fabricated work was initially on loan from the artist's estate, but in 2010, after several months of intense fundraising efforts, "the museum acquired the work for an undisclosed amount reported to exceed $3 million and [with an insurance valuation of] 'over $5 million.'" The purchase was "made possible by The Belldegrun Family's gift to LACMA in honor of Rebecka Belldegrun's birthday", per the museum. Eli and Edythe Broad contributed $10 million to fund the purchase of Richard Serra's Band sculpture, on display on the first floor of BCAM when the building opened. Surrounding the BCAM building and LACMA's courtyard is a 100 palm tree garden, designed by artist Robert Irwin and landscape architect Paul Comstock. Some of the 30 varieties of palms are in the ground, but most are in large wooden boxes above ground. Directly in front of the new entrance to LACMA on Wilshire Boulevard, where Ogden Drive once bisected the 20-acre campus between Wilshire Boulevard and 6th Street, is Chris Burden's Urban Light (2008), an orderly, multi-tiered installation of 202 antique cast-iron street lights from various cities in and around the Los Angeles area. The street lights are functional, turn on in the evening, and are powered by solar panels on the roof of the BP Grand Entrance. Originally Jeff Koons' Tulips (1995–2004) sculpture was inside the Grand Entrance building and Charles Ray's Fire Truck (1993) was outside in the courtyard, both lent by the Broad Art Foundation. Both sculptures were removed after being on display for 3 months due to unexpected damage from patrons and wear. On February 2, 2007, Michael Govan, with Koons, revealed plans for a 161-foot (49 m)-tall Koons sculpture featuring an operational 1940s locomotive suspended from a crane. The sculpture would be located at the entrance on Wilshire Boulevard, between the Ahmanson Building and the Broad Contemporary Art Museum. By 2011, after "the fundraising climate soured and Koons’ California fabricator, Carlson & Co, went out of business after completing a $2.3-million feasibility study" and a $25 million estimated cost, Govan said "We don't have a final method of construction, and I don't have a final fundraising plan." Koons said they are now working with the German fabricator Arnold, outside of Frankfurt, to do an additional engineering study, and Govan says he has committed to spending half a million dollars for that study. The museum has J.B. Turner Engine (1986), a small Koons piece which was shown in the 2006–2007 “Magritte and Contemporary Art: The Treachery of Images" exhibition. Levitated Mass by artist Michael Heizer is the latest project at LACMA. On December 8, 2011, this 340-ton boulder, 21.5 feet wide and 21.5 feet in height, was ready to leave its quarry in Riverside County, after months of postponements. It sits atop the 456-foot-long trench which allows people to walk under and around the massive rock. The move started on February 28, 2012 and completed on March 10, 2012. The art piece was opened on June 24, 2012 by Heizer, Los Angeles County Supervisor Zev Yaroslavsky, and Los Angeles City Mayor Antonio Villaraigosa. The Wallis Annenberg Photography Department was launched in 1984 with a grant from the Ralph M. Parsons Foundation. It has holdings of more than fifteen thousand works that span the period from the medium's invention in 1839 to the present. Photography also is integrated into other departments. Although LACMA's photo collection encompasses the entire field, it has many gaps and is far smaller than that of the J. Paul Getty Museum. In 1992 Audrey and Sydney Irmas donated their entire photography collection, creating what is now the Los Angeles County Museum of Art's Audrey and Sydney Irmas Collection of Artists' Self-Portraits, a large and highly specialized selection spanning 150 years. The couple donated the collection two years before a major exhibition of the collection was mounted at LACMA; the display included photos of and by artistic photographers ranging from chemist Alphonse Poitevin in 1853 to Robert Mapplethorpe in 1988. Among other self-portraits in the collection were those of Andy Warhol, Lee Friedlander, and Edward Steichen. Audrey Irmas continues to buy for the collection, but now all the additions are gifts to LACMA. In 2008 LACMA announced that the Annenberg Foundation was making a $23 million gift for the acquisition of the Marjorie and Leonard Vernon collection of 19th- and 20th-century photographs. Among the 3,500 master prints are works by Steichen, Edward Weston, Ansel Adams, Eugène Atget, Imogen Cunningham, Catherine Opie, Cindy Sherman, Barbara Kruger, and Man Ray. The gift also provided an endowment and capital to help build storage facilities for the museum's photographic holdings, leading to the its photography department being renamed the Wallis Annenberg Department of Photography. In 2011 LACMA and the J. Paul Getty Trust jointly acquired Robert Mapplethorpe’s art and archival material, including more than 2,000 works by the artist. LACMA's film program was founded by Phil Chamberlin in the late 1960s. In 2009 LACMA announced plans to cancel its 41-year-old film series, citing declining attendance and funding. The decision drew widespread criticism from cinephiles, including film director Martin Scorsese, who wrote an open protest letter that was published in the Los Angeles Times. In response, the museum expanded its movie offerings and partnered with Film Independent to launch a new series. In 2011 LACMA and the Academy of Motion Picture Arts and Sciences announced partnership plans to open a movie museum within three years in the former May Co. building. In 2014, LACMA received a $500 million donation of art from businessman Jerry Perenchio. The 47-piece collection contains works by Paul Cézanne, Edgar Degas, René Magritte, Édouard Manet, Claude Monet, and Pablo Picasso. LACMA executive director Michael Govan said it was the biggest gift in the museum's history, and The Washington Post called it "conceivably one of the greatest art gifts ever, to any museum." Perenchio's donation, which becomes effective upon his death, occurs only if the museum completes construction of the new building designed by Peter Zumthor. The $54 million Resnick Pavillon was made possible by a $45 million gift from the philanthropists for whom it is named. On March 6, 2007, BP announced a $25 million donation to name the entry pavilion under construction as part of LACMA's renovation campaign the "BP Grand Entrance". The $25 million gift matches Walt Disney Co.'s 1997 gift for Disney Hall as the biggest corporate donation to the arts in Southern California. Previously, in 2006, LACMA had announced that the new entrance would be called the "Lynda and Stewart Resnick Grand Entrance Pavilion", in honor of their $25 million gift. An 18th-century painting of Hindu goddesses Matrikas fighting demons, from LACMA. Lime Spoon with cast picaflor, 1250-1470, Peru, Inca. On January 8, 2008 Eli Broad revealed plans to retain permanent control of his roughly 2,000 works of modern and contemporary art in the independent Broad Art Foundation, which loans works to museums, rather than giving the art away. Broad, as recently as a year prior, had said that he planned to give most of his holdings to one or several museums, one of which was assumed to be LACMA. However, LACMA remains the "preferred" museum to receive works from the Foundation. Broad, previously vice chairman of LACMA's board of directors, financed the $56-million Broad Contemporary Art Museum (BCAM) building at LACMA; he also provided an additional $10 million to buy two works of art to be displayed in it. BCAM displayed 220 pieces borrowed from Broad and his Broad Art Foundation when it opened in February 2008. In 2001 LACMA was criticized for hosting a major exhibition of Broad's collection without having secured a promised gift of the works, an act that is prohibited at many prominent art institutions because it can increase the market value of the collection. In 2002 the Annenberg Foundation gave the museum $10 million to establish a special endowment fund to support exhibitions, art acquisitions and educational programs at the discretion of its director. In recognition of the gift, LACMA named its leadership position the Wallis Annenberg directorship. In 2001 Wallis Annenberg endowed a curatorial fellowship program with a $1-million gift. In 1991, the foundation contributed $10 million to LACMA's endowment and in 1999 it donated $100,000 to provide arts education training for Los Angeles elementary school teachers. In 2001 the museum lost out on the modern art collection of Nathan and Marian Smooke, a former museum trustee and industrial real-estate developer whose heirs sold much of his collection at auction rather than donating it. In 1996 the museum suffered yet another serious blow when the Gilbert Collection of Italian mosaics and other decorative objects, promised as an eventual bequest, and parts of which had been on display for decades, was withdrawn. The would-be donor claimed that the Museum had reneged on a written agreement to provide more exhibit space for it. The collection is considered one of the finest in the world of its kind. Moreover, unlike the Hammer and Simon collections, it did not remain in the Los Angeles area but was removed to the United Kingdom. Armand Hammer was a LACMA board member for nearly seventeen years, beginning in 1968, and during this time continued to announce the museum would inherit his whole collection. Hammer's collection included works from Van Gogh, John Singer Sargent, Thomas Eakins, Gustave Moreau, Edgar Degas, and Paul Cézanne. When LACMA was offered a collection of works by Honoré Daumier, Hammer bought the works on the promise that he would give them to the museum. To LACMA's surprise, Hammer instead founded the Hammer Museum, built adjacent to Occidental's headquarters in Los Angeles. In the early 1970s Norton Simon, the chairman of Norton Simon, Inc., which owned Avis Car Rental, Hunt's Foods, Max Factor Cosmetics, Canada Dry Corp., and McCall's Publishing, among other interests, agreed to take the financial responsibility of the troubled Pasadena Museum of Art. Norton Simon Museum He subsequently donated his extensive collection to the new entity, now the Norton Simon Museum of Art. He had earlier made some indication of donating the work to LACMA. From 1946 to his death in 1951, William Randolph Hearst was LACMA's largest benefactor. He remains the largest donor to the museum in number of objects. His donations formed the museum's collection of Greek and Roman antiquities, medieval and early Renaissance sculptures, and much of the collection of European decorative arts. Over the course of the LACMA's history, ten art councils—each supporting a specific area of the collection—have acquired or helped acquire nearly 5,000 works of art for the museum. The art councils comprise groups of art enthusiasts and professionals who pay a minimum of $400 a year in dues and organize projects to raise money for a favorite department. Founded in 1952, the Art Museum Council is LACMA's first volunteer support council and supports the whole of the museum's endeavors. The Modern and Contemporary Art Council, founded in 1961, is the longest-running support group for contemporary art at any museum in the country. In 1986 the Annual Collectors Committee weekends were started and have raised a total of $16 million for the purchase of 157 works, valued at $75 million. The Photographic Arts Council, founded in 2001, is the youngest of ten 10 support groups, offering its members visits to artists' studios and private collections, curator-led tours of exhibitions and lectures about the care and conservation of photographs. Each year a distinguished group of donors contributes directly to the enrichment of LACMA's permanent collection through participation in the Collectors Committee, creating a fund to spend on art through purchasing tickets ranging between $15,000 and $60,000 for the event. Once a year, the Collectors Committee members meet at the museum to hear acquisition proposals from the various curators. Each curator has roughly five minutes to plead their case to the patrons, who vote later that day at a black-tie gala event at the museum on which artworks should become the next acquisitions for the permanent collection. The 2012 gala raised more than $2.8 million. Since its inception in 1986, the event has brought some 170 works of art into the museum's collection. The museum puts on an annual gala dinner, inaugurated in 2011 featuring entertainment by international artists and hosted by national entertainers such as Angeleno Leonardo Di Caprio (2012). The annual event, the Art + Film Gala, is designed to help the museum shore up support from Hollywood leaders. Gala prices range from $5,000 for an individual gold ticket to $100,000 for a platinum table. The 2018 gala raised approximately $4.5 million for the museum's operations and collections, up from $4.1 million in 2013 and just under $3 million in 2011. Gala honorees have included Catherine Opie and Guillermo del Toro in 2018; Mark Bradford and George Lucas in 2017; Kathryn Bigelow and Robert Irwin in 2016; Alejandro González Iñárritu and James Turrell in 2015; Barbara Kruger and Quentin Tarantino in 2014; Martin Scorsese and David Hockney in 2013; the late Stanley Kubrick and Ed Ruscha in 2012; and Clint Eastwood and John Baldessari in 2011. Along with other museums that have consigned works to auction in the past, LACMA has been sharply criticized for pruning its art holdings. In 2005, on the occasion of the expansion, reorganization and reinstallation of its collection in 2007, LACMA auctioned 43 works at Sotheby's. The works sold included paintings by Amedeo Modigliani, Camille Pissarro and Max Beckmann, sculptures by Alberto Giacometti and Henry Moore, and works on paper by Pablo Picasso, Henri Matisse and Edgar Degas. The biggest sale of works by the museum since the early 1980s, it was expected to fetch $10.4 million to $15.4 million; it eventually resulted in a total of $13 million. Among the most valuable was a Modigliani portrait of the Spanish landscape painter Manuel Humbert, which sold for $4.9 million. In 1966 Maurice Tuchman, then curator of modern art at the Los Angeles County Museum of Art, introduced the Art and Technology (A&T) program. Within the program, artists like Robert Irwin and James Turrell were placed, for example, at the Garrett Corporation, to conduct research into perception. The program yielded an exhibition that ran at LACMA and traveled to Expo '70 in Osaka, Japan. It also contributed to the development of the Light and Space movement. Andrea Rich won praise for doubling the museum's endowment, to more than $100 million, and for increasing attendance and pursuing programs and acquisitions that might appeal to the varied segments of the city's diverse population, like Islamic, Latin American and Korean art. Rich resigned in part because of disputes with Eli Broad, including one over hiring a curator for the new Broad contemporary art center. In 2008, LACMA made a formal offer to merge with MOCA and to help that museum raise new money from donors. Per the Los Angeles County Code and various operating agreements, Museum Associates, a nonprofit public benefit corporation organized under the laws of the state of California, manages, operates, and maintains the Los Angeles County Museum of Art. In 2011, LACMA reported net assets (basically, a total of all the resources it has on its books, except the value of the art) of $300 million. That year, the museum's endowment grew from $99.6 million to $106.8 million. By issuing $383 million in tax-free construction bonds, the museum paid for its ongoing expansion and renovation, which has yielded the new Broad Contemporary Art Museum and the Resnick Exhibition Pavilion as well as other improvements. The Los Angeles County provides around $29 million a year, covering more than a third of the museum's operating expenses. LACMA typically raises around $40 million from donations and membership dues, which are accounted for as gifts, paying for almost half of LACMA's average expenses of about $92 million. Although attendance has grown in recent years, it still remained at 914,356 visitors in 2010. In 2011, around 1.2 million visitors went to LACMA, making it the first time the museum broke the one million mark. In 2015, attendance reached 1.6 million. Between 1993 and 1995, Chief Deputy Director Ronald B. Bratton was handling financial and administrative activities and Stephanie Barron, chief curator of modern and contemporary art, was coordinating curatorial affairs. In 1996, LACMA's board of trustees decided that the traditional dual role of director as chief administrator/artistic director should be split, and appointed Andrea Rich as president and chief executive officer of the museum, while Graham W. J. Beal ran its artistic programs. As part of a 2005 restructuring, the president position was again made the second-ranking job in the institution. LACMA is governed by a Board of Trustees which sets policy and determines the museum's strategic direction. Board membership is one of the few concrete ways to measure philanthropy in the museum world. LACMA costs $100,000 to join; each board member commits to donating or raising at least another $100,000 a year for the nonprofit museum. 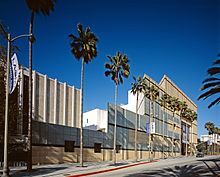 The museum currently has 50 active board members; 30 of them have joined since 2006, including Barbra Streisand, songwriter Carole Bayer Sager, collector Dasha Zhukova, TV journalist Willow Bay, producer Brian Grazer, Sony Pictures Entertainment chairman Michael Lynton, and TV presenter Ryan Seacrest. As of 2014, the board is co-chaired by former Warner Brothers executive Terry Semel and TV producer-writer Andrew Gordon. Ashurnasirpal II and a Winged Deity, Northern Iraq, Nimrud, gypseous alabaster, 9th century B.C. ^ "Visitor Figures 2016" (PDF). The Art Newspaper Review. April 2017. p. 14. Retrieved March 23, 2018. ^ "Overview". LACMA. June 30, 2011. Retrieved May 10, 2013. ^ a b Doug Stevens (April 10, 2015), LACMA then, now and in the future Los Angeles Times. ^ "Webb Spinner 1963-1964" (PDF). ^ William Wilson (July 3, 1986), New Building Plan For County Museum Of Art Los Angeles Times. ^ Christopher Knight (April 29, 1992), The Impact of County Art Museum's Earl Powell Los Angeles Times. ^ Mary Lou Loper (November 7, 1986), Plenty of News at County Art Museum Los Angeles Times. ^ Suzanne Muchnic (July 17, 1999), Museums Rediscover Beauty, Right in Their Own Backyard Los Angeles Times. ^ "May Co. Building to Reopen as LACMA West". Los Angeles Times. October 22, 1998. ^ a b Suzanne Muchnic (December 3, 2002), LACMA finds itself in two funding worlds Los Angeles Times. ^ a b Suzanne Muchnic (December 6, 2001), L.A. Art Museum Decides to Radically Reshape Itself Los Angeles Times. ^ Christopher Reynolds (December 26, 2002), The Rise and Stall of LACMA's Planned Reinvention Los Angeles Times. ^ a b Rachel Lee Harris (November 25, 2010), Construction Has Halted at Los Angeles Museum New York Times. ^ "Historic Alliance Opens Door to Academy Museum at LACMA" (PDF). Retrieved May 10, 2013. ^ LACMA Steps in to Preserve L.A.'s Leaning Tower of Folk Art (October 25, 2010), ARTINFO. ^ a b Jori Finkel (June 24, 2014), A Contemporary Design Yields to the Demands of Prehistory New York Times. ^ Christopher Hawthorne (May 1, 2013), LACMA draws up ambitious plans for a $650-million new look Los Angeles Times. ^ Christopher Hawthorne et al. (June 24, 2014), LACMA changes building plan to accommodate La Brea tar pits Los Angeles Times. ^ a b Mike Boehm (June 25, 2014), Supervisor Molina starts new foundation to oversee Grand Park Los Angeles Times. ^ Mike Boehm (November 6, 2014), L.A. County supervisors embrace LACMA's financing plan for makeover Los Angeles Times. ^ Noelene Clark (April 10, 2015), LACMA's 50 years on Miracle Mile: ‘Art and Technology’ exhibit opens Los Angeles Times. ^ Jonathan Griffin (May 8, 2014), Los Angeles, 1970s style Archived April 8, 2015, at the Wayback Machine The Art Newspaper. ^ Kelly Scott (November 14, 2011), Doing the numbers on LACMA's Tim Burton show Culture Monster, Los Angeles Times. ^ Noelene Clark (April 10, 2015), LACMA's 50 years on Miracle Mile: Picasso exhibition pleases public and critics Los Angeles Times. ^ Christopher Knight (March 2, 2013), LACMA's overhaul is a work in progress Culture Monster, Los Angeles Times. ^ David Ng (July 10, 2013), Stanley Kubrick at LACMA was popular, but not like Tim Burton Los Angeles Times. ^ Suzanne Muchnic (January 6, 2005), Robert Halff, 96; Ad Exec, Museum Donor Los Angeles Times. ^ Suzanne Muchnic (June 21, 2009), 'Your Bright Future' spotlights Korean artists at LACMA Los Angeles Times. 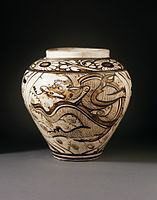 ^ Suzanne Muchnic (July 21, 1999), LACMA Gets $3.5-Million Gift of Chinese Art Los Angeles Times. ^ "Islamic Art". Los Angeles County Museum of Art. Retrieved December 23, 2015. ^ Suzanne Muchnic (January 2, 2009), LACMA fashions a new reputation Los Angeles Times. ^ Miracle Mile: Sculpture Garden to Open Los Angeles Times, May 2, 1991. ^ Christopher Knight (May 12, 2009), Alexander Calder's 1964 'Hello Girls' back on view at LACMA Los Angeles Times. ^ iPad iPhone Android TIME TV Populist The Page (October 13, 1967). "October 13, 1967 Time magazine cover featuring ''Smoke'' sculpture by Tony Smith". Time.com. Retrieved May 10, 2013. ^ Finkel, Jori, "Tony Smith's monumental sculpture 'Smoke' will not disappear from LACMA; multimillion-dollar purchase finalized", Los Angeles Times Culture Monster blog, June 18, 2010 4:32 pm. Retrieved 2011-07-10. ^ "Tony Smith ... Smoke" Archived November 5, 2011, at the Wayback Machine, Collections page, LACMA website. Retrieved 2011-07-10. ^ "LACMA Acquires Monumental Sculpture By American Artist Richard Serra" (PDF) (Press release). Los Angeles County Museum of Art. May 2007. Archived from the original (PDF) on October 3, 2007. Retrieved May 9, 2008. ^ Suzanne Muchnic (April 12, 2008), Public art a victim of its success Los Angeles Times. ^ "Transforming LACMA > Progress Report". Archived from the original on May 18, 2011. Retrieved July 10, 2011. ^ a b Finkel, Jori, "LACMA's Michael Govan on Jeff Koons' locomotive, James Turrell retrospective", Los Angeles Times Culture Monster blog, May 16, 2011 1:27 pm. Retrieved 2011-07-10. ^ Finkel, Jori, Since that time, State safety officials have panned the idea of hanging any object from a crane for an extended period of time, suggesting that Govan build a replica of a crane and locomotive instead. "A master works his magic on museum: Michael Govan has transformed LACMA and become a cultural force. He's not done. ", Los Angeles Times, May 15, 2011. Retrieved 2011-07-10. ^ "Jeff Koons ... J.B. Turner Engine" Archived January 30, 2012, at the Wayback Machine, Collections page, LACMA website. Retrieved 2011-07-10. ^ "Where's The Rock? | Zev Yaroslavsky". Zev.lacounty.gov. October 13, 2011. Archived from the original on April 1, 2013. Retrieved May 10, 2013. ^ Deborah Vankin (September 22, 2011), LACMA set to roll away the stone, Los Angeles Times. ^ Suzanne Muchnic (August 14, 2010), Eclectic photo exhibition from LACMA arts council at Duncan Miller Gallery, Los Angeles Times. ^ Myrna Oliver (August 30, 1996), Sydney Irmas; Art Collector, Benefactor, Los Angeles Times. ^ Susan Freudenheim (September 10, 2002), Where Art Is a Household Word, Los Angeles Times. ^ Bob Colacello (October 2009), Her Own Kind of Annenberg, Vanity Fair. ^ Jori Finkel (February 8, 2011), LACMA, Getty to share Robert Mapplethorpe artwork, Los Angeles Times. ^ David Ng (September 11, 2009), Ian Birnie sees encouraging signs from turmoil at LACMA, Los Angeles Times. ^ Reed Johnson (May 25, 2012), That 'Look of Love' between LACMA and Hollywood, Los Angeles Times. ^ a b McDonald, Soraya Nadia (November 7, 2014). "Jerry Perenchio, a Very Private Man, Just Publicly Bequeathed the L.A. County Museum Half a Billion Dollars Worth of Art". The Washington Post. Retrieved November 7, 2014. ^ Robert L. Pincus (September 9, 2010),  New York Times. ^ Suzanne Muchnic (November 5, 2011), The Imperfect Pursuit of Collections Los Angeles Times. ^ Jori Finkel (November 28, 2012), Outcry as Los Angeles County Museum of Art raises patron fees Los Angeles Times. ^ Suzanne Muchnic (May 15, 2011), 50 years of support — and changing tastes — at the Los Angeles County Museum of Art Los Angeles Times. ^ Jori Finkel (May 8, 2009), My Dream Is for Sale; Buy It for Me New York Times. ^ Suzanne Muchnic (August 14, 2010), Eclectic photo exhibition from LACMA arts council at Duncan Miller Gallery Los Angeles Times. ^ a b Deborah Vankin (April 27, 2014), LACMA curators lobby for new pieces at Collectors Committee event Los Angeles Times. ^ Jori Finkel (April 19, 2011), LACMA hits the market Los Angeles Times. ^ Christopher Wyrick (April 13, 2013), Francis Ford Coppola, Diane Keaton Kick Off LACMA Collectors Committee Weekend The Hollywood Reporter. ^ Jori Finkel (April 19, 2010), New treasures for LACMA Los Angeles Times. ^ Jori Finkel (July 23, 2012), LACMA's next art-film gala to honor Ed Ruscha, Stanley Kubrick Los Angeles Times. ^ Matthew Stromberg (November 4, 2018), LACMA's Art + Film Gala blurs boundaries between the museum world and Hollywood Los Angeles Times. ^ David Ng (November 3, 2013), Martin Scorsese, David Hockney feted at LACMA gala Los Angeles Times. ^ Jori Finkel (October 28, 2012), Big Hollywood turnout for LACMA's Ruscha and Kubrick gala Los Angeles Times. ^ Deborah Vankin (November 5, 2017), LACMA's Art + Film Gala honors Mark Bradford and George Lucas Los Angeles Times. ^ David Ng (August 16, 2016), Kathryn Bigelow, Robert Irwin to be honored at LACMA gala Los Angeles Times. ^ David Ng (July 15, 2015), Alejandro Gonzalez Inarritu, James Turrell to be honored by LACMA Los Angeles Times. ^ David Ng (August 11, 2014), Quentin Tarantino, Barbara Kruger will be honorees at LACMA gala Los Angeles Times. ^ a b Suzanne Muchnic (November 4, 2005), LACMA art brings in $13 million Los Angeles Times. ^ Mike Boehm (January 14, 2009), LACMA says it's judiciously pruning collections Los Angeles Times. ^ Carol Vogel (October 26, 2005), Museums Set to Sell Art, and Some Experts Cringe New York Times. ^ Randy Kennedy (December 9, 2013), Art and Technology, Together Again, at Los Angeles County Museum of Art New York Times. ^ David Ng (December 10, 2013), LACMA resurrects art and technology program, teams with Google Los Angeles Times. ^ Carol Vogel (February 2, 2006), Dia Official May Be Hired By Los Angeles Museum New York Times. ^ Edward Wyatt (February 10, 2008), To Have and Give Not New York Times. ^ Edward Wyatt (December 16, 2008), Los Angeles Museum Proposes to Save Another New York Times. ^ Shane Ferro (July 25, 2012), As MOCA's Money Woes Simmer, A Look at How Major Museums' Finances Work BLOUINARTINFO. ^ Mike Boehm (October 23, 2010), Michael Govan's LACMA contract renewal revealed Los Angeles Times. ^ Mike Boehm (November 20, 2010) Los Angeles County Museum of Art officials halt further construction until more donations are secured Los Angeles Times. ^ Mike Boehm (August 15, 2011) LACMA's bond rating drops to A3 Los Angeles Times. ^ Mike Boehm (December 16, 2014) Getty hires new top fundraiser after early efforts show modest results Los Angeles Times. ^ Javier Pes and Emily Sharpe (March 23, 2012), Attendance survey 2011: Brazil’s exhibition boom puts Rio on top Archived June 26, 2014, at the Wayback Machine The Art Newspaper. ^ Javier Pes, José da Silva, Emily Sharpe (March 29, 2017), figures 2016: Christo helps 1.2 million people to walk on water[permanent dead link] The Art Newspaper. ^ Suzanne Muchnic (March 16, 1995), Yearlong Search Still Hasn't Produced a LACMA Director Los Angeles Times. ^ Christopher Knight (March 31, 1996), Proper Pedigree for LACMA Post: Graham Beal brings a stellar reputation to art museum Los Angeles Times. ^ Christopher Reynolds (June 8, 2005), LACMA names a new president Los Angeles Times. ^ Mike Boehm (November 2, 2009) Songwriter Carole Bayer Sager and two others join LACMA's board Los Angeles Times. ^ Jori Finkel (October 28, 2010), Museums roll out the red carpet for Hollywood Los Angeles Times. ^ David Ng (June 16, 2014), Ryan Seacrest, Ann Ziff among new trustees at LACMA Los Angeles Times. Wikimedia Commons has media related to Los Angeles County Museum of Art. LACMA's permanent collection: Access to more than 80,000 works of art from the museum's permanent collection. Via this website, the museum also enables users to download and use, without any restrictions, high quality images of nearly 20,000 works of art they deem to be in the public domain.